The Town of Lemberg Saskatchewan lost the skating rink of their Community Recreation Centre to fire. Olympia Steel Buildings competed with a number of pre-engineered building manufacturers and won the project with competitive pricing and good service. The team at Olympia Steel Buildings Canada worked closely with the Community Recreation Centre Committee to design and engineer a pre-engineered steel building 85 feet wide by 230 feet long by 20 feet high at the eaves to replace what had been lost to fire. The new building is designed to meet a high occupancy load requirement that provides an extra degree of safety to the people using the building. The more than nineteen thousand square foot steel building ordered from Ontario-based Olympia Steel Buildings will feature a skating surface and a lobby when construction is completed. The new building became necessary following the March 10, 2011 blaze that destroyed the former skating rink, a 50-year-old wooden Quonset style building. Twenty firefighters called in from both Lemberg and Neudorf fire departments battled the blaze and were able to save the lobby and curling rink. However, the structural damage to skating rink itself was too extensive to repair. The curling rink, not damaged by the fire, will remain open while the new ice skating rink is being constructed, with completion anticipated in early 2013. “It means a lot to the community to rebuild their ice rink – I’m glad Olympia was there to help,” asserts Steve Wetmore of Olympia Steel Buildings Of Canada. Olympia Steel Buildings are supplied by Universal Steel Buildings Corp, an industry leader in pre-engineered steel buildings for over 40 years, and sole supplier of Olympia Steel Buildings® to commercial, industrial, agricultural, residential, government, military and civilian agencies. Olympia Steel Buildings come with their outstanding weather-resistant PBR roof, or you can opt for their patented Zeus-Shield® standing seam metal roofing system. GSA approved Olympia Steel Buildings set them apart by using better materials, better quality control, exceptional customer service and industry-leading warranties, including a 25-year rust through perforation warranty. Olympia pre-engineered steel buildings are precision engineered and expertly erected to give you a “tight” building that reduces air infiltration into the building saving on HVAC costs. They offer 12 energy efficient colors for metal buildings to reduce cooling costs and come with a 40-year warranty against chipping, cracking, peeling or blistering. 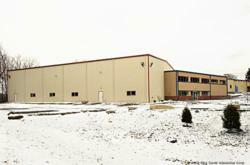 Because of such key features, Olympia pre-engineered steel buildings can qualify under LEED Green Building guidelines. For more information about Olympia Steel Buildings of Canada, visit their website http://www.olympiasteelbuildings.ca or call 866-479-3292 for more information.